A gigantic super-planet has been snapped by astroboffins orbiting the massive star Kappa Andromedae. The super-Jupiter dwarfs any of the planets found in the Solar System, with a mass at least 13 times that of Jupiter and an orbit that is larger than Neptune's. Its host star - Kappa Andromedae - is 2.5 times the size of our Sun, which makes it the highest mass star to ever host a directly observed planet. The star is so huge, it can be seen with the naked eye in the constellation Andromeda, even though it's 170 light years away. "Our team identified a faint object located very close to Kappa Andromedae in January that looks much like other young, massive directly imaged planets but does not look like a star," said Thayne Currie of the University of Toronto, a co-author of the study. "Kappa Andromedae moves fast across the sky so it will appear to change position relative to more distant, background objects. "When we reobserved it in July at multiple wavelengths, we saw the faint object again, located at about the same position as it was in January. This indicates that it is bound to the star and not an unrelated background object." The researchers, who are part of the Strategic Explorations of Exoplanets and Disks with Subaru (SEEDS) project, spotted the planet using the Subaru telescope in Hawaii. Labelled by the researchers as Kappa And b, the picture is the first direct rendering of an exoplanet in two years and the first new exoplanet system discovered for nearly four years. 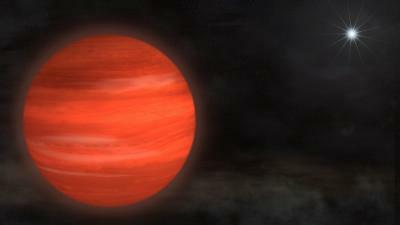 Younger planets retain the heat from their formation, making them brighter and easier to spot at infrared wavelengths. Despite this, actually capturing a picture of one is exceptionally rare. "Although astronomers have found over 750 planets around other stars, we actually directly detect light from the atmosphere of only a few of them," said Currie. "There are approximately six now. Kappa And b is one of them if our estimates for its age and mass are correct, which we think they are." The formation of this system is also unusual, due to the massive star at its centre and Kappa And b's distance from it. Some theorists have suggested that bigger stars could have bigger planets in a simple scaled-up version of our Solar System. But if a star is too big, its radiation would disrupt normal planet formation. "This planetary system is very different from our own," Currie says, "Kappa And b is located further from the star than any of the solar system planets are from the Sun. "Because it is generally much harder to form massive planets at large distances from the parent star, Kappa And b could really be a challenge for our theories about how planets form."